It's her last summer before college and Shabnam doesn't know how she'll spend it. Her best friend Farah has gone off the deep end and started wear hajib (even though she wears it with hairstyles calculated to drive her mother nuts). Shabnam doesn't know what to make of her usually rebellious friend. But when she meets Jamie, none of it matters. Jamie is inquisitive and charming and Shabnam falls head of heels for him. But more than a story of summer romance, the novel is about how the love for family and friends matters most in the end. In other words, there are plenty of good ingredients in this book, but it all comes at you at once. Now, one could argue that life is like this: that a story only about wearing hajib or a summer romance (or Urdu poetry or the Partition that created modern India and Pakistan or a mother grieving the loss of her unborn babies or an absent-minded father) is not enough to carry a 270 page novel. But it is also safe to say that it is a bit too much to throw all of that into the mix and expect it to stand. The writing is good, but the characters felt largely interchangeable, with voices that were not distinct. Even the father, who has the most interesting mannerisms largely sounds like every other person in the story. 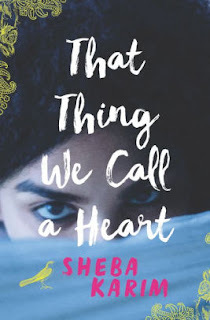 Shabnam herself starts off as grating, giving her plenty of room for growth during the story -- and Karim's depiction of that growth provides sufficient payoff for the reader.